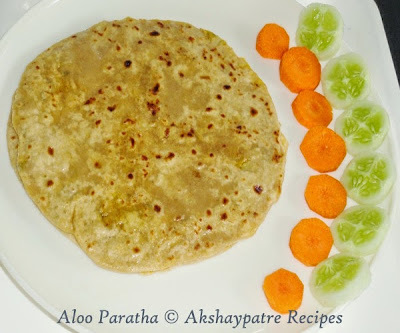 Aloo paratha recipe - This is an easy to prepare aloo paratha which I like to make often. When my kids were small they were not eating vegetables. Therefore I thought of stuffing the vegetables in the roti itself and I was making thepla. Later I started to stuff almost all vegetables (except bitter gourd), dals, beans, sprouts, etc. Thus, my family developed liking towards parathas and still I am continuing it. Aloo paratha is an Indian flat bread prepared with wheat flour, all purpose flour and potato filling, then shallow fried on griddle. 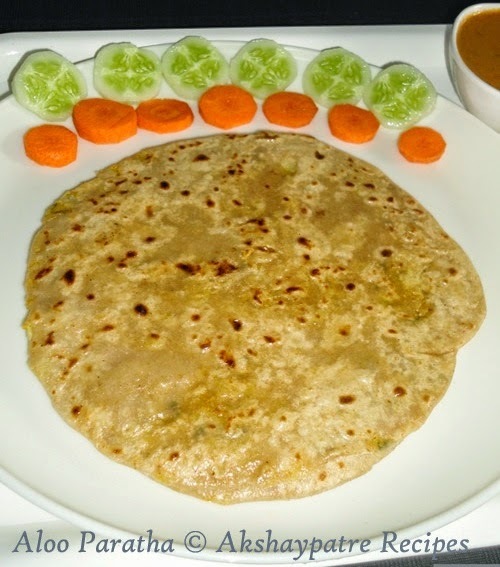 This paratha is North Indian speciality, usually served for breakfast, lunch or dinner. Making stuffed paratha is bit tedious and it needs little bit of practice to roll gently after the stuffing. Combine together the flours and sieve them. Add salt to it. Knead them to a soft dough adding little water. Keep it aside for 15 mins. Wash and peel the potatoes. Steam cook the potatoes until soft. Allow it to cool and then grate it. Heat little oil in a pan and add onions to it. Saute till translucent. Then add the masala and powders mentioned under "for the filling". Saute for 2 mins and remove from the flame. Add coriander leaves and salt. Mix well and allow it to cool. Add grated steamed potatoes to the onion mixture, stir to combine. Add some salt and knead it to a lump till the salt mix well. Divide the dough into 12 equal portions. Take one portion and make a round ball from it. Roll out the ball into small poori sized round disc. Take 2 tbsp of filling and place it on the roti. Lift the edges and join them in the top giving modak shape to it, then twist the tip. Now flatten it with your palm and gently roll out into slightly thick paratha. Heat a griddle and apply 1/4 tsp ghee on it. Place the rolled paratha over it. Pour 1/4 tsp of ghee around the paratha. Shallow fry it till golden brown from both sides. Serve the stuffed aloo paratha hot with curries, chutneys, pickles and yogurt. Apply ghee on the paratha if you like it. 1. Wash and peel the potatoes. Steam cook the potatoes until soft. Allow it to cool and then grate it. 2. Heat little oil in a pan and add onions to it. Saute till translucent. 3. Then add the masala and powders mentioned under "for the filling". Saute for 2 mins and remove from the flame. 4. Add coriander leaves and salt. Mix well and allow it to cool. Add grated steamed potatoes to the onion mixture, stir to combine. 5. Add some salt and knead it to a lump till the salt mix well. 6. Divide the dough into 12 equal portions. Take one portion and make a round ball from it. Roll out the ball into small poori sized round disc. 7. Take 2 tbsp of filling and place it on the rolled disc. Lift the edges and join them in the top giving modak shape to it, then twist the tip as shown in the picture below. 8. Now flatten it with your palm and gently roll out into slightly thick paratha. 9. Heat a griddle and apply 1/4 tsp ghee on it. Place the rolled paratha over it. 10. Serve the aloo paratha hot with curries, chutneys, pickles and yogurt. Apply ghee on the paratha if you like it. Love aloo parathas alot.. they looks perfect.. Awesome paratha!! hmmmm love the idea of stuffing all vegetables. Aloo parathas are my all time favourite parathas.Makes me hungry.